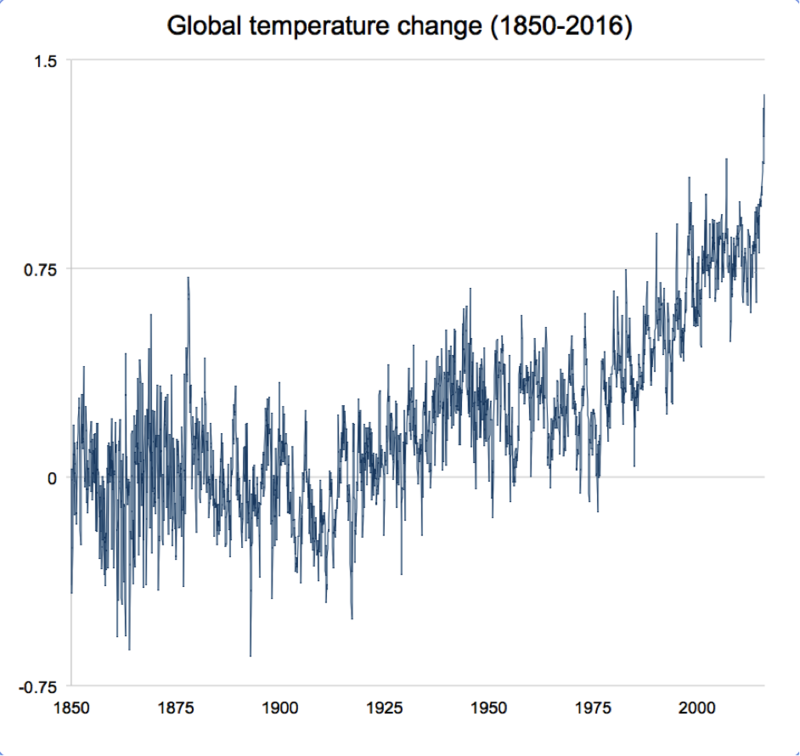 Earlier this week, Climate Lab Book posted a wonderful (and terrifying) climate change visualization that swept the internet, or at least the parts of the internet that care about climate change and like cool charts, as we here at Graphicacy do. There are a number of great things to note about this graphic, including the clean design, effective use of color, and animation. But what’s most remarkable is that everyone has already seen this data. This should look familiar to anyone who regularly reads about climate change. So why did the spiral chart go viral? Is it because it communicates something new that people didn’t already know? Or is it because people like mesmerizing gifs? 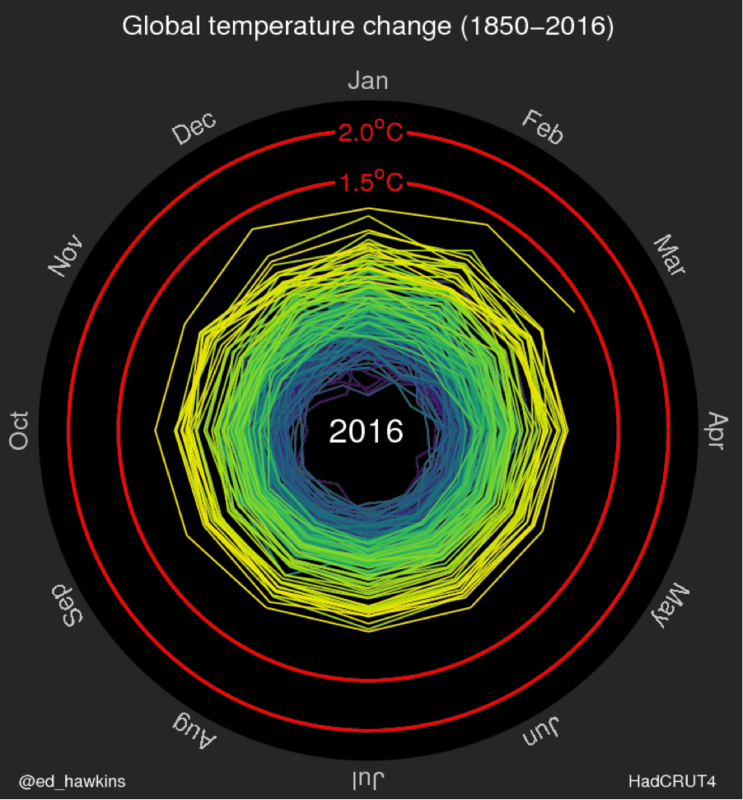 One advantage of the spiral is that it highlights the drastic temperature increase of the past year. By overlaying years, those with extreme temperatures (2015-16) stand out, while the others blend together. But this is all information that is contained in the line chart. In fact, the line chart does a better job of communicating the nuances of the historical trend. The dominant message of the spiral is that the earth is warming, and 2015 was the hottest year on record – something that most people who saw it probably already knew. – The spiral is beautiful. The spiral is an interesting shape in striking colors. The line chart is fairly unattractive – we could add color but it probably wouldn’t help much. On the spiral chart, color corresponds to time rather than temperature as might be assumed – one could argue with that decision but the effect is pleasing to the eye. – The spiral is mesmerizing. The spiral is fun to look at, and this matters. It would be fun to watch even if it weren’t telling an interesting story. Animation is a useful tool to convey information and draw an audience in, and gifs have untapped potential as a data viz medium. – The spiral is an interesting way to visualize the data. I think this, more than anything, is the significant piece. People like graphs. People enjoy looking at colored shapes that represent data and figuring out the connecting logic. Understanding the visualization logic of the spiral is a miniature brain game that makes us say “aha.” The line chart, for all it’s usefulness, is something we have seen many times, and doesn’t provide us with any new puzzle to solve. In a great piece on “the inevitability of data visualization criticism,” Andy Cotgreave explains that every visualization could be a line chart or bar chart, but a successful visualization must be both clear and engaging.